Malvern Male Voice Choir will be singing on the 5th April in St Edmunds Hall, College Road, Malvern in a fund raising concert in support of Cancer Research entitled ‘What Would I Do Without My Music’. The event will include a wide selection of songs ranging from 1960s hits, musical showstoppers to Welsh standards and English and French classics. The soloists will be Emma Burrows (soprano) who is returning to sing with the Choir and Michael Blake (piano) who is the Choir’s accompanist and is currently studying at the Birmingham Conservatoire of Music. The concert will support the local committee of the world’s leading cancer charity, Cancer Research UK. The organisation relies entirely on public support, receiving no funding from central government. The local arm is one of over 900 groups from around the country and has raised in excess of £500,000 since 1962. Malvern Male Voice Choir has supported the Local Group for approaching 10 years and is very pleased to continue to do so in this its 92nd year of singing. 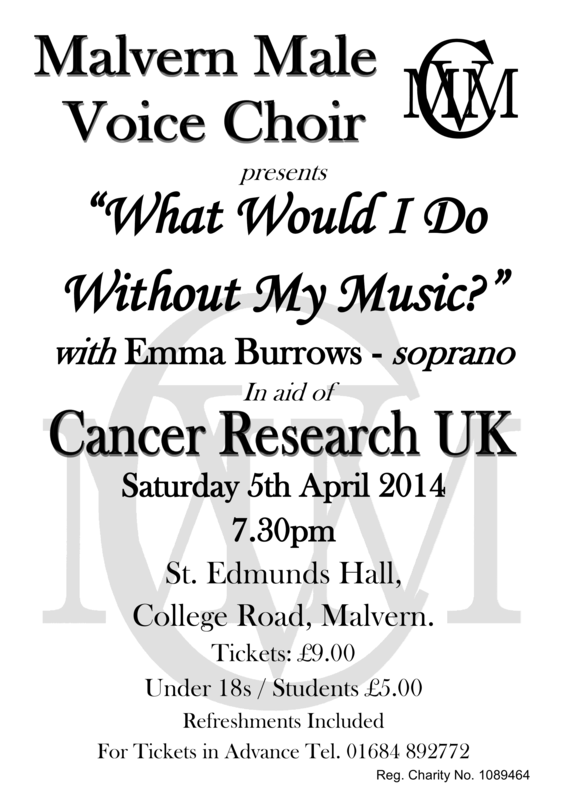 The concert is at St. Edmunds Hall, Malvern College, College Road, Malvern on Saturday 5th April and starts at 7.30pm. Tickets cost £9 (under 18’s – £5) to include light refreshments, and can be purchased in advance from 01684 892772. Any remaining tickets can be purchased on the door from 7.00pm.